Presented in partnership with the Oriental Institute at the University of Chicago. About the book: The ancient Egyptian Book of the Dead is a series of magical spells that promised to transform any living person into an immortal divinity in the afterlife. This exhibit of more than 50 objects explores what the Book of the Dead was, what it was believed to do, how it worked, how was it was made, and what happened to it. The show features two spectacular Books of the Dead—one 41 feet long—which are shown in their entirely for the first time in nearly a century. A recreation of a burial with a rarely exhibited mummy shows how so many objects inscribed with the Book of the Dead literally surrounded the deceased, some spells being written on linen bandages, others on amulets that were placed on the mummy, yet others on bricks that were embedded in the walls of the burial chamber. The Oriental Institute's exhibit presents the newest research on the Book of the Dead, what it meant to the ancient Egyptians, and how through text and elaborate imagery, they sought to live forever as gods. A fully illustrated catalog edited by exhibit curator Dr. Foy Scalf accompanies the show. About the author: Foy Scalf is Research Associate; Head of Research Archives; and Head of the the Integrated Database Project at the Oriental Institute of the University of Chicago. He also acts as Principal Investigator for a corpus-based digital project known as OIDOO, the Oriental Institute Demotic Ostraca Online. He received his PhD in Egyptology from the University of Chicago in 2014 with a dissertation examining funerary literature from Roman Egypt and identifying its origins in the oral traditions attested in graffiti from preceding centuries. 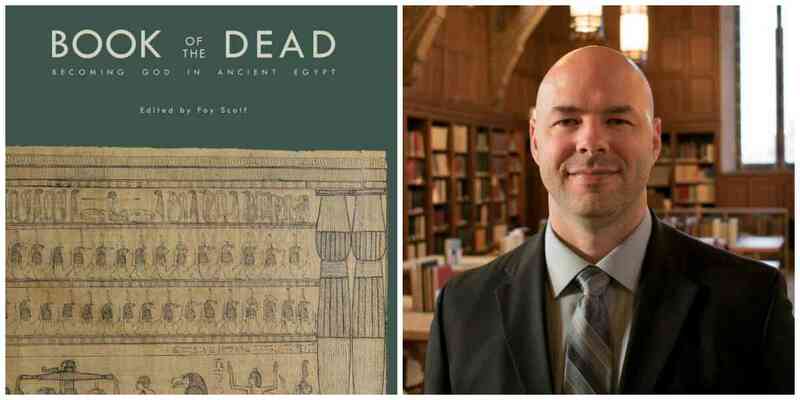 He is currently curating a special exhibit for the Oriental Institute Museum called "Book of the Dead: Becoming God in Ancient Egypt" and he assembled a group of internationally-acclaimed scholars as editor of the accompanying catalog. In 2016, he was awarded the Archival Innovator Award by the Society of American Archivists for his role in the Oriental Institute's Integrated Database Project. About the interlocutor: Rita Lucarelli is an Assistant Professor of Egyptology at the Near Eastern Studies Department of the University of California, Berkeley. She is also an Assistant Curator of Egyptology at the Phoebe A. Hearst Museum of Anthropology of the University of California, Berkeley and a Fellow of the Digital Humanities in Berkeley. Her research interests include religion, magic and science in ancient Egypt and in Antiquity, ancient Egyptian funerary literature, demonology in ancient Egypt and Antiquity and the application of Digital Humanities tools and techniques in Egyptology. She is completing a monograph on demonology in ancient Egypt and from 2009 to 2012, she worked on the Book of the Dead Project at the University of Bonn, Germany (http://totenbuch.awk.nrw.de//). She is also the author of one monograph (The Book of the Dead of Gatseshen: Ancient Egyptian Funerary Religion in the 10th Century BC) published in 2006 and of several scholarly articles on funerary texts and demonology, which appeared in peer reviewed Egyptological journals and volumes.